Police said they arrested 22 people at the construction site of the Dakota Access oil pipeline, claiming people were interfering with equipment. The arrests were made 70 miles northwest of the Standing Rock Sioux tribe’s main protest site. The Morton County Sheriff’s Office said about 50 law enforcement police responded to events the site near Glen Ullin Tuesday after construction workers said they had been “swarmed” by protesters and that two people had “attached” themselves to equipment. The protesters face charges of criminal trespassing, and the two attached to equipment faces charges of hindering law enforcement and disorderly conduct, according to the Sheriff’s spokeswoman, Donnell Preskey, according to AP. The site near Glen Ullin is not part of the temporary work stoppage ordered by the federal judge or the section the federal government asked Energy Transfer Partners to voluntarily stop work on last Friday. 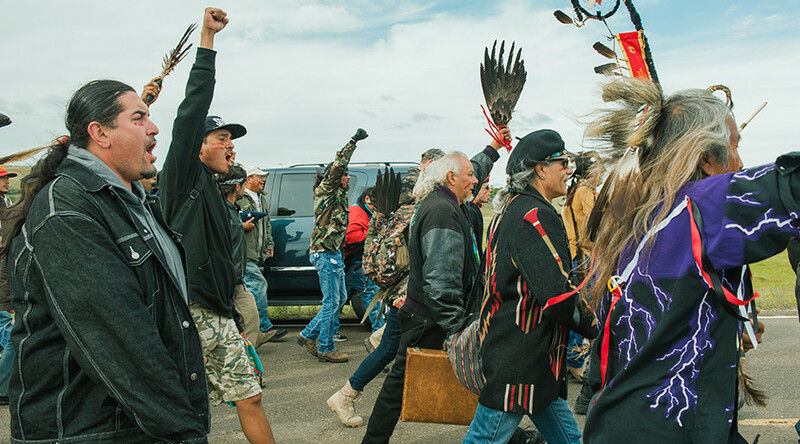 Hundreds of people from over 200 indigenous nations have gathered in the area to support the Standing Rock Sioux Tribe, which claimed in a lawsuit filed against federal regulators that the oil pipeline would harm water supplies and disturb sacred burial and cultural sites. The lawsuit challenges the Army Corps of Engineers’ decision to grant about 200 permits at water crossings for the pipeline. For now, the federal government has issued a temporary halt to construction on Army Corps land around and underneath Lake Oahe, one of six reservoirs on the Missouri River. Three federal agencies also asked Energy Transfer Partners for a “voluntary pause” in work for 20 miles on either side of Lake Oahe. The head of Energy Transfer Partners told employees in a memo Tuesday that it was committed to the project despite strong opposition and a federal order to voluntarily halt construction near Stand Rock Sioux tribe reservation in North Dakota. “I am confident that as long as the government ultimately decides the fate of the project based on science and engineering, the Dakota Access Pipeline will become operational…So we will continue to obey the rules and trust the process,” Kelcy Warren, CEO of Energy Transfer Partners, wrote to employees, according to Associated Press. Standing Rock Tribal Chairman Dave Archambault II said he and the thousands of others who have gathered at the southern North Dakota site won’t budge. “People are still coming down here and are committed to stopping the project,” he told AP. Energy Transfer Partners are developing a $3.8 billion Dakota Access pipeline, that once completed would travel through four states. The 1,172-mile project would carry nearly a half-million barrels of crude oil daily from North Dakota’s oil fields through South Dakota and Iowa to an existing pipeline in Illinois.